All songs © 1984, 1994 The Zappa Family Trust d/b/a/Munchkin Music (ASCAP) except track 5 © 1972, 1994 The Zappa Family Trust d/b/a Frank Zappa Music/Munchkin Music (ASCAP), Track 1 © 1956, renewed 1984 Longitude Music Co. (BMI), Track 14 © 1970 Warner-Tamerlane Publishing Corp. (BMI) & Elijah Blue Music (BMI). 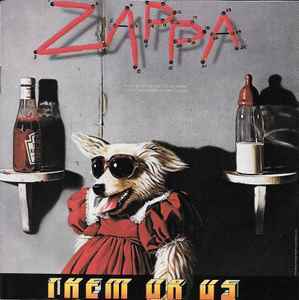 ℗ 1984 Rykodisc © 1984, 1995 The Zappa Family Trust. Reproduced under license. The green-tinted CD jewel box is a registered trade-mark of Rykodisc. Printed in the USA. Manufactured in Canada. Artwork copyright 1995 The Zappa Family Trust. Engineered at the Utility Muffin Research Kitchen. Marqueson's Chicken, Them or Us: Instrumental.